Mujahid Hussain is an ace mehndi artist based in Hyderabad. Let’s check out his stunning mehndi designs! Mujahid has been applying mehndi for the past 16 years. A highly educated, young and creative person, he was drawn to the art at a very young age, given that he was surrounded by many traditional arts in the aesthetic city of Hyderabad. Mujahid’s exceptional professionalism and creative capabilities have led to associations and collaborations with many industry leaders and he has taught several students himself. He was invited to be the Lead Instructor at Henna Conference 2015 and Instructor at Spring Fling Henna Conference 2015. He is known for stunning designs and his signature peacock motif. let’s check out some of his best designs and get to know him better. 1. Tell us about yourself – when did you begin doing this and how did you think of getting into this line? I hold two Master’s in Business Administration Degrees in Finance and Information Systems Management respectively. I have been doing professional henna for the past 16 years. I first started doing mehndi when I was about 12-13 years old, my interest in mehndi started with doodling, I loved intricate designs and patterns and I remember that my first mehndi happened on the Chand Raat, when my sister got a mehndi design done at a parlor, but she did not like it, I offered to help fix the design, after that incident I fell in love with the mehndi cone. But I used to do it privately and only for family members. In 1999, I participated and won 1st Prize in ‘Best Henna Artist (Junior)’ at All India Industrial Exhibition. It was a huge boost to my confidence and I started doing it professionally since then. I loved mehndi so much because I was at liberty to express myself through this art form and it also provided me with financial independence. There has been no turning back since. I love fusion designs, with both a traditional motifs and contemporary designs. The unique blend of tradition and modern art, creates a very distinct and eye catching design and fusion designs are very much in vogue now. I create beautiful designs for all my clients, they are all custom made to suit each one’s needs and as a matter of fact no two bridal mehndi designs of mine are ever the same. I think I owe each of the brides I work with this exclusivity. But my absolute favorite design, which is also very often reproduced by several mehndi artists is the peacock design. This design can be represented and reproduced in several different ways. 3. Most memorable experience you had while doing henna designs? My most memorable experience, which is also very personal happened quite recently (on December 12th, 2015) when I did the bridal mehndi for my sister. She has inspired me and it was on her that I did my very first mehndi design ever. Doing her mehndi again made me relive all the 16 years of my mehndi career. From my very first mehndi on her hand to finally doing her bridal mehndi, it felt like all those 16 years were a mere moment and it was the same Chand Raat when I first did my henna on her. 4. 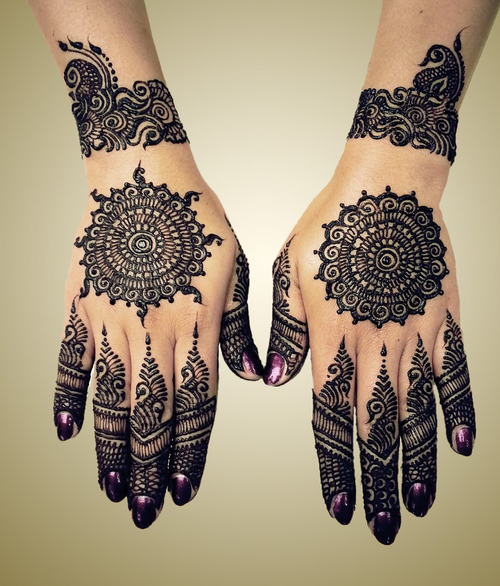 What are your most important tips to take care of henna design after applied? How long should henna be kept? 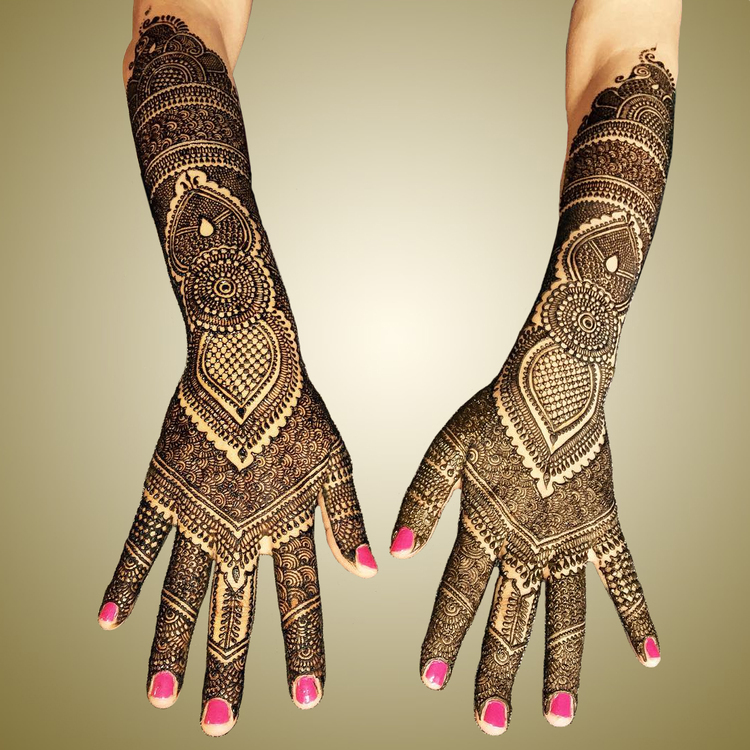 Everyone has their own time frame to keep the mehndi on after its application, it depends on the type of mehndi used and the composition of mehndi paste. My advice is to keep it on for 3-4 hours, I feel that it is sufficient, keeping it longer creates unnecessary inconvenience. 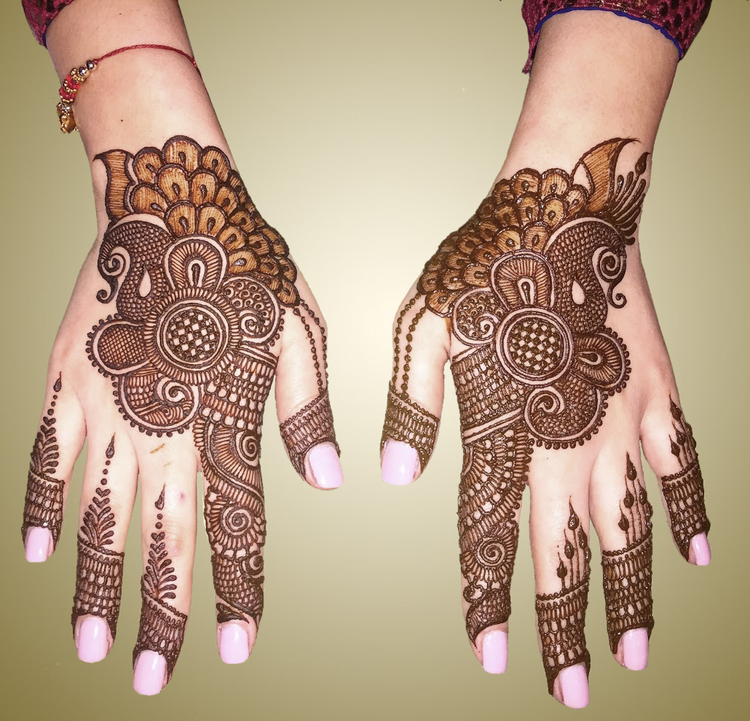 For darker color As long as the mehndi is kept on, keep applying a mixture of sugar & water at intervals of 20 minutes, or sugar-water syrup can be replaced by lime juice, but lime juice is not recommended during winters or in cold places. How to take henna off? 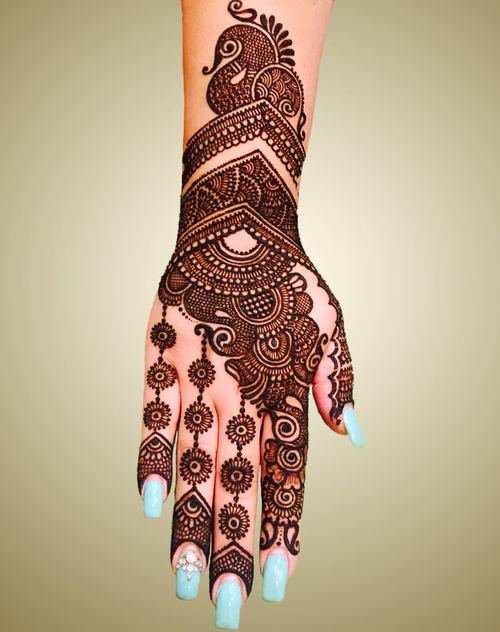 Never use water to take it off, instead scrape henna off either using hand, scrapper or a cloth. If you want dark shade of mehndi, water is very detrimental. 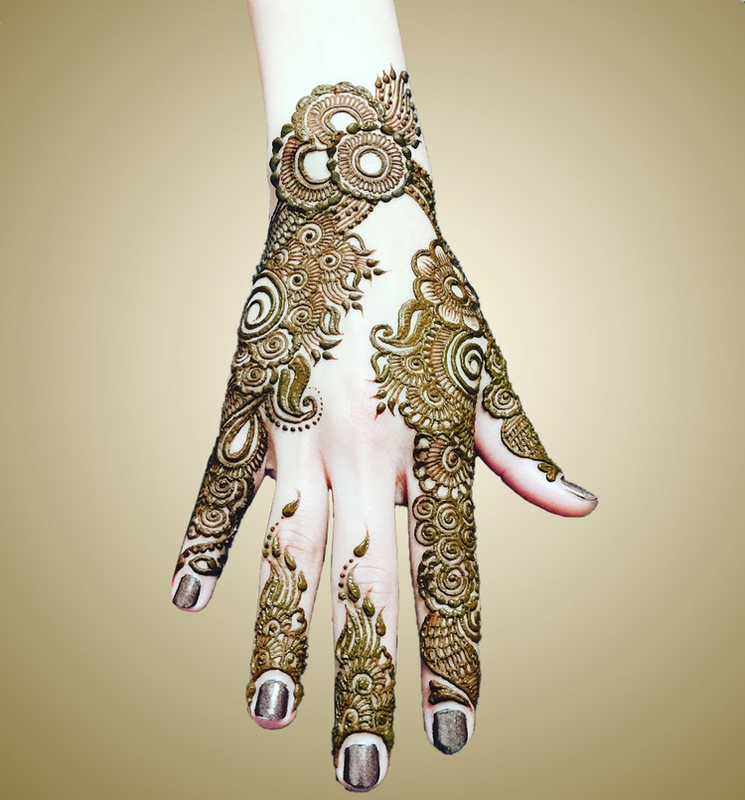 After scrapping off Rub the mehndi with any balm or cooking oil can also be used as a substitute. 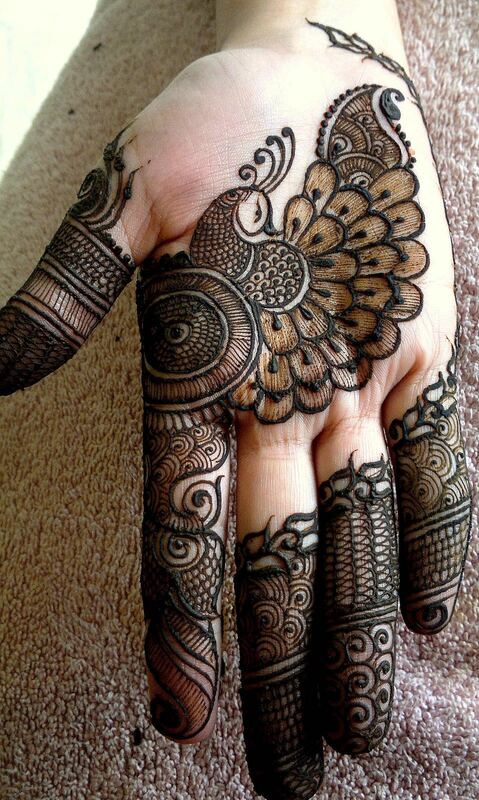 This would help get a dark and beautiful mehndi stain. 5. What is the best way to reach you (website/fb page)? I can be reached via Facebook, Instagram or my website.